To start bringing my responses to Lance Conley to a close, I want to examine the imminence that permeates and exudes from the text of Romans 8:16f– an imminence that Conley totally ignores. It is more than revealing that Conley has not offered any kind of exegetical response to any of my articles. He has continued to call me derogatory names, to impugn my character, to question my standing before God. And, when others have offered similar remarks he has literally cursed at them, calling them vulgar, obscene names and blocking them from posting! But, no exegesis! This is truly sad, and reveals a deeply flawed character – not to mention a total inability to deal with the issues raised in these articles. This installment will focus on the incredible, virtually overwhelming imminence that literally permeates the text of Romans 8:16f. Now, don’t forget that Conley openly admitted to ignoring and omitting the key contextual elements of verses 16-18, as he began his presuppositional claims about this great passage at verse 19. His admission that he ignored verses 16-18 is absolutely stunning and revealing, because those verses set the context, they control the entire discussion of verses 19f. Yet, again, Conley admitted that he ignored those verses. I have asked the reader of this series to ask yourself: How can anyone claim to have done any kind of serious interpretation, of any text, when you purposefully omit, purposefully refuse, to discuss the context setting and context controlling verses? That is an exercise in eisegesis and hermeneutical futility. It is doomed to misinterpretation. There are several key elements, key words, motifs and themes found in Romans 8:16f that communicate the undeniable reality that Paul expected the “redemption of creation” (no matter our concept of that) very soon. Not two thousand years (and counting) later, but in his generation. Woe to you, scribes and Pharisees, hypocrites! Because you build the tombs of the prophets and adorn the monuments of the righteous, and say, ‘If we had lived in the days of our fathers, we would not have been partakers with them in the blood of the prophets.’ “Therefore you are witnesses against yourselves that you are sons of those who murdered the prophets. Fill up, then, the measure of your fathers’ guilt. Serpents, brood of vipers! How can you escape the condemnation of hell? Therefore, indeed, I send you prophets, wise men, and scribes: some of them you will kill and crucify, and some of them you will scourge in your synagogues and persecute from city to city, that on you may come all the righteous blood shed on the earth, from the blood of righteous Abel to the blood of Zechariah, son of Berechiah, whom you murdered between the temple and the altar. Assuredly, I say to you, all these things will come upon this generation. “O Jerusalem, Jerusalem, the one who kills the prophets and stones those who are sent to her! How often I wanted to gather your children together, as a hen gathers her chicks under her wings, but you were not willing! Now, was Paul, were the apostles, the very last believers to ever die for the Lord? Patently not! And that is not the point. The point is that the blood guilt that had been filling up Israel’s cup of sin for a long time was now finally overflowing, and her judgment– the eschatological judgment– was about to fall. The vindication of all of the saints and worthies– see Hebrews 11 – was coming soon in Jesus’ coming against Jerusalem. This means that you cannot extrapolate the filling up of the measure of sin and suffering – and the judgment to follow– beyond the first century– without doing violence to the texts. And their dead bodies will lie in the street of the great city which spiritually is called Sodom and Egypt, where also [a]our Lord was crucified. (Keep in mind that Jesus said it was Jerusalem that had shed all the martyrs blood, shed on the earth). As a result of this filling up of the measure of sin and suffering, The Great Day of God’s Wrath (Revelation 6 / 11 / 16 / 19) was about to fall on the city “where the Lord was crucified ”: “Behold, I come quickly, and my reward is with me, to reward every man” (Revelation 22:10-12). There is a consistent, harmonious, unified testimony in scripture about the filling up of the measure of blood guilt – and it pointed directly to Israel! Israel’s measure of sin– and the saints’ measure of suffering– was to be filled up in the first century– (Matthew 23:33-37 / 1 Thessalonians 2:15-17 / Revelation 17:6f). That suffering was Paul’s the “suffering of the present time” (literally, the suffering of the now time”) in Romans 8:18f. It had no application to the normal human experience of sickness, financial woes, etc.. It was persecution for the name of Christ, and, historically and contextually, at the hands of Israel. That persecution would result in the judgment at the Great Day of the Lord’s Wrath. 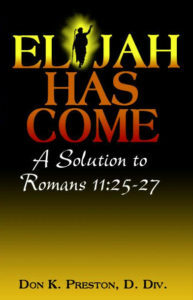 See my discussion of those sufferings in my Elijah Has Come: A Solution to Romans 11:25-27. What that means is that in Romans 8:18f, where suffering and martyrdom is at the center of attention, with the attendant promise of the “about to be” glory and vindication, that we must honor that consistent, united, harmonious testimony, and admit that Paul had the impending, imminent vindication and glorification of the saints in mind. And that vindication came in AD 70 with the destruction of Jerusalem, the bloody, harlot city. Unless one can definitively divorce Paul’s reference to the “sufferings of Christ” and the “suffering of this present time” from Jesus’ teaching on the filling up of the measure of sin and suffering, this is virtual prima facie proof that the “glory that is about to be revealed in us” had reference to the impending vindication of their suffering at the parousia of Christ. This is in fact what Paul promised in 2 Thessalonians 1. In our next installment, I will look at that “glory about to be revealed” and show where Paul posited that coming glory in his imminent future. There is literally no justification, no contextual support at all, to extrapolate the fulfillment of Romans 8 beyond the first century. And that means that Mr. Conley’s entire objection to my articles is moot and false. His presuppositional approach to the text, openly admitting that he ignored these issues, exposes the fallacy of his claims. Romans 8:18f was fulfilled in the first century. Previous Previous post: Zechariah 14 and Israel Only?